It's no secret that our household are big Disney fans. Some of my favourite Disney films are Aladdin and Beauty and the Beast, so to see my daughter fall in love with the same ones is magical. 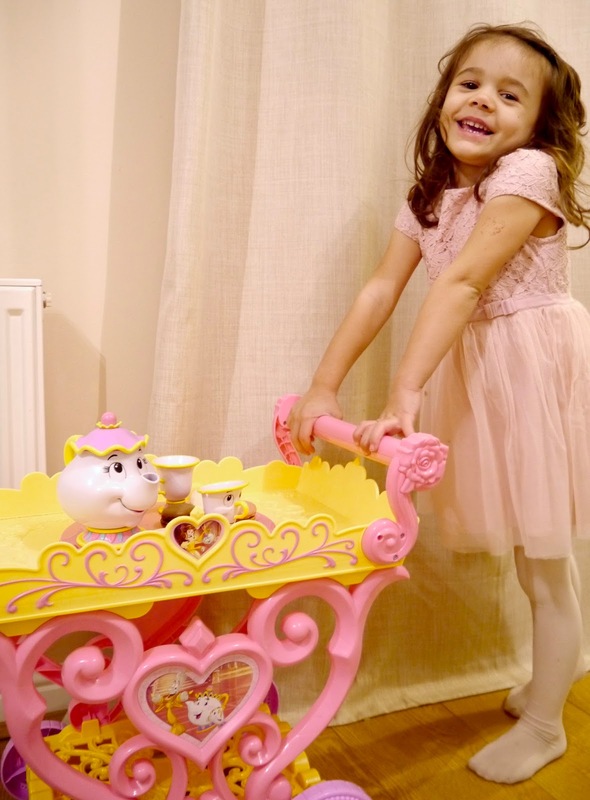 Eva has recently started watching Beauty and the Beast and is mesmerised by all the characters with Princess Belle being her favourite. We were delighted to be asked if we'd like to review the new Princess Belle's Musical Tea Cart by Jakks Pacific. I'd already seen it at a Blog Conference and couldn't resist a play so I knew Eva would love to receive it. The cart needs assembling but is very straightforward. No DIY skills required. It also comes with batteries (always a bonus in my opinion). It comes with a Mrs Potts teapot with removable lid, a Chip cup, spare cup, spoons and an invitation. There's a rose shaped button on the side of the cart to activate the iconic song 'be our guest,'. 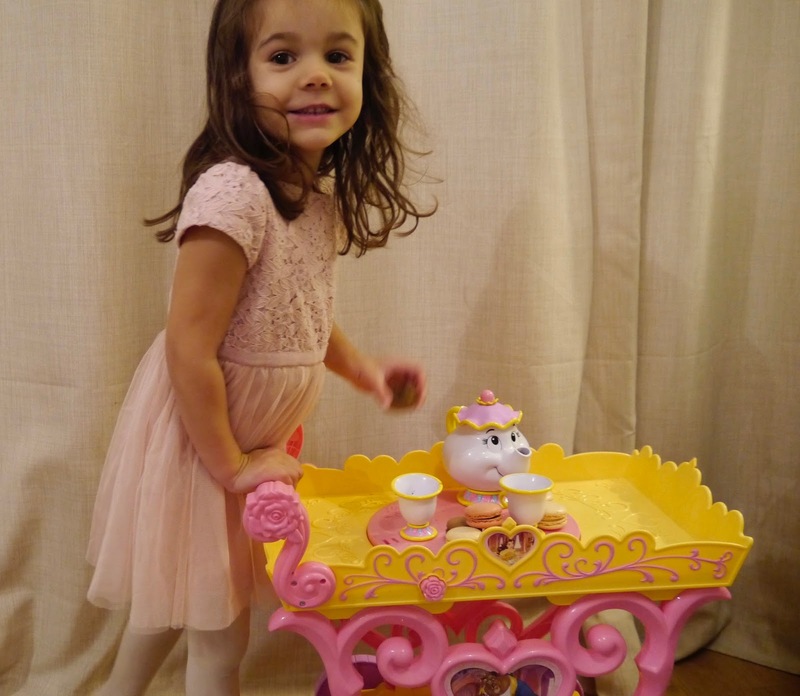 Mrs Potts, chip and the spare cup then spin around on the cart to the music. The cart itself is pink and yellow. Anything with pink on is a winner with Eva. There's also some lovely Beauty and the Beast stickers on the cart. The cart has been a huge hit in our house with both Eva and Ophelia. Eva has relished holding little tea parties for us. 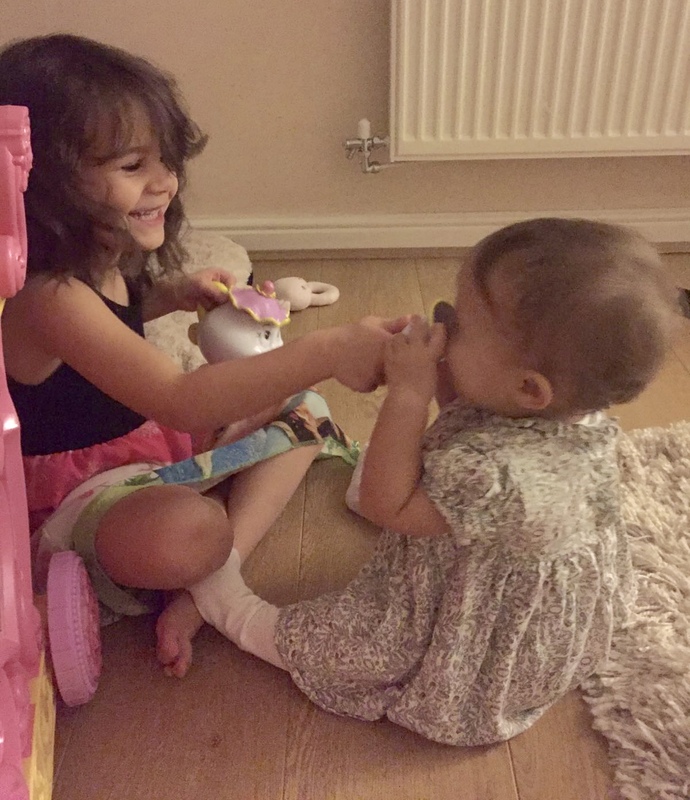 She loves to make her sister sit down and be her guest. Ophelia is also very fascinated with it. She's not walking yet but seems to love crawling through the bottom of the cart (not recommended by the way but she enjoys it). She also loves to dance to the song. There's plenty of room on top of the cart, around the lazy Susan to place food or use any other tea set that you may have at home. I've been very impressed with the quality of the cart. It's plastic so I didn't think it would be as sturdy as it is. Both the girls have bashed it about and it still doesn't have a scratch on it which is reassuring. The cart moves along nicely. Eva finds it very easy to push and manoeuvre. It's the perfect height for her to play with. The only thing I will say is that it's quite big so bare that in mind if you don't have a lot of space. It doesn't fold down. This will make a lovely gift for any Beauty and the Beast fan. With the new film being released next year this is going to be a must have toy. Now that looks like a lot of fun and it's useful that it's easy to put together. My kids are too old for this now but my little nieces would love it! I have heard a lot about this tea cart recently. 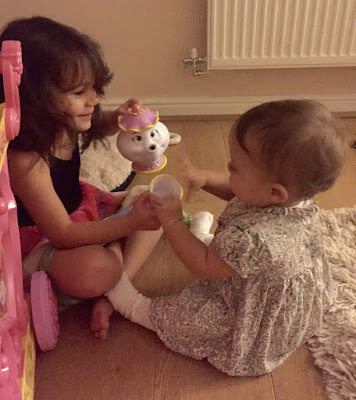 Looks like Eva and Ophelia had lots of fun trying it out. I am a huge Beauty and the Beast fan and Mrs Potts is one of my favourite characters in any film. I don't think I will encourage either of my boys to have this though, no matter how much I love it! 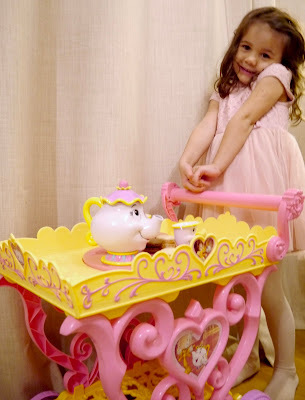 What a cute tea cart. This is the type of thing I'd love as a child! I'm a big fan of Beauty and the Beast too - I love singing along to the soundtrack in the car, lol! 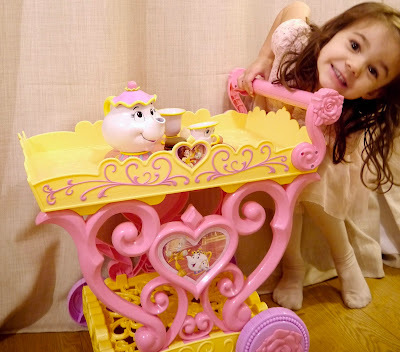 Such an adorable tea cart, this! I wish mine weren't too big for it! I want one! Oh wow she is such a cutie! Fabulous idea! I've seen this on another blog and it's so adorable. Looks like she enjoys playing with it. Aww she looks so thrilled with this! My little niece would love it too! This looks absolutely gorgeous (as do your girls in the pics!). It's lovely that it moves along so well and is great for creative play. Fab gift! 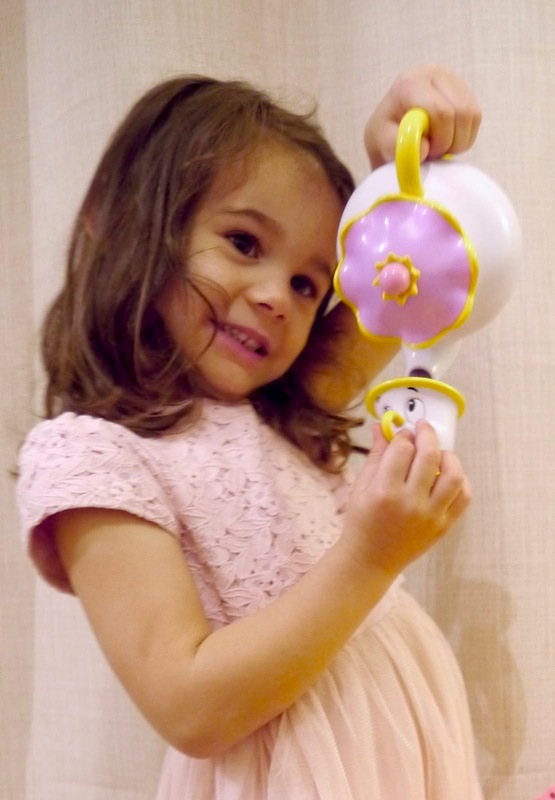 This looks like a fabulous toy for Beauty and the Beast fans. My daughter would love this! My daughter would have loved this when she was younger. I think it might need to be bought for my friend's little girl now though! Love the colours! That is so pretty!! I love the idea you could use this to play with friends too.